Easy to clean up, Non-toxic, acid-free, 100% baby safe ink to create keepsake imprints of a baby’s feet. Use them to stamp on scrapbook pages, announcements, invitations, track baby’s growth month after month or best of all as baby’s signature on anything and everything for family and friends. 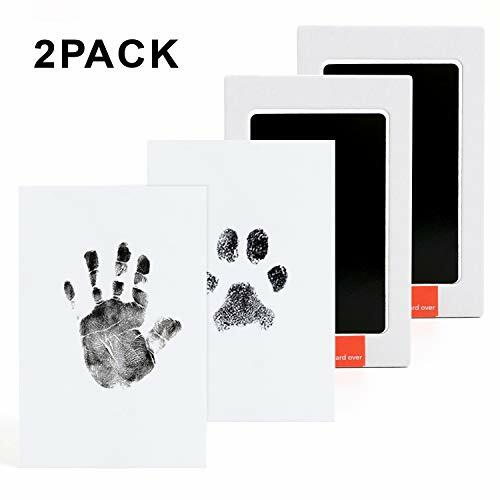 What’s more, you can use it to take paw prints for your lovely little pets. Not suitable for large pets! Step 1 – Remove everything from the packaging and place on a table or the floor. Place the clean-touch ink pad, ink side down on the included white, imprint card. Step2 – Gently press baby’s hand or foot onto the clean-touch ink pad. Press down hard enough to create the print. Each ink pad includes 1 imprint card. Ink pads will accommodate newborn’s hand/feet up to 2.36″ wide x 3.7″ long. Step 3 – Once the print is transferred onto the imprint card, slowly remove the clean-touch ink pad. Let it dry for 24-48 hours and display in your home. 2.This baby print ink pad is one-time product. In usual case, every ink pad can be used for twice or three times. 3.Let the imprint card dry a few minutes after your print. And do not touch it in case the print is scratched. Please measure the size of your little baby’s hand or foot or your pet’s paw to avoid this is too small or too large. Thank you for your kind understanding. 2 x white imprint cards. ❤100% Baby Safe, Non Toxic and Acid Free. Safe to use. ❤No Mess and easy to use. Achieves two highly detailed prints. ❤Wonderful baby shower gift and it is a wonderful keepsake. ❤Best way to capture special memories of your little sweet newborns or your lovely pets. ❤Package Includes: 2 ink pads and 2 imprint cards. 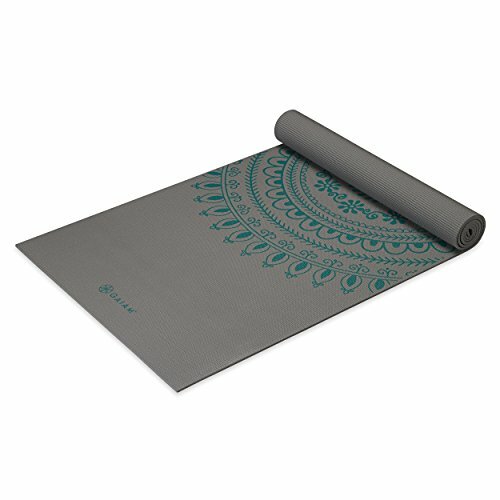 Ink pad accommodates hands/feet up to 3.74″ length x 2.36″ width. This entry was posted on December 3, 2018, in Wood. 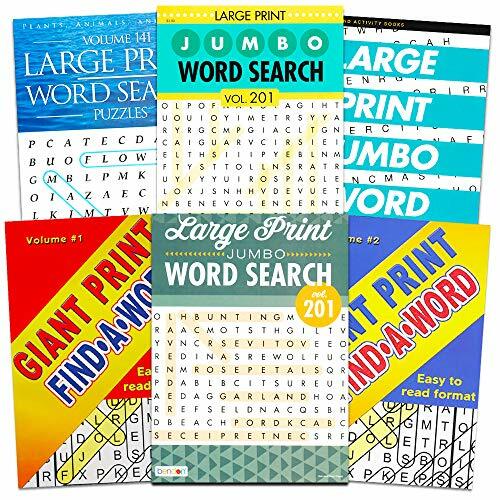 Large Print Word Search Books for Adults and Seniors: Pack of 6 Deluxe Easy-To-Read Word Find Puzzle Books. 6 books filled with stimulating word puzzles — words cleverly hidden in every puzzle. Fascinating themes throughout. Each book measures 8×11 inches and includes approximately 96 pages. Over 500 pages of word find puzzles total. All new puzzles, all new words, new format and layout. Hours of mind-stimulating fun. Large Print Word Search Books for Adults and Seniors: Pack of 6 Deluxe Easy-To-Read Word Find Puzzle Books. 6 books filled with stimulating word puzzles — words cleverly hidden in every puzzle. Each book measures 8×11 inches and includes approximately 96 pages. Over 500 pages of word find puzzles total. All new puzzles, all new words, new format and layout. Hours of mind-stimulating fun. This entry was posted on December 3, 2018, in Jewelry. 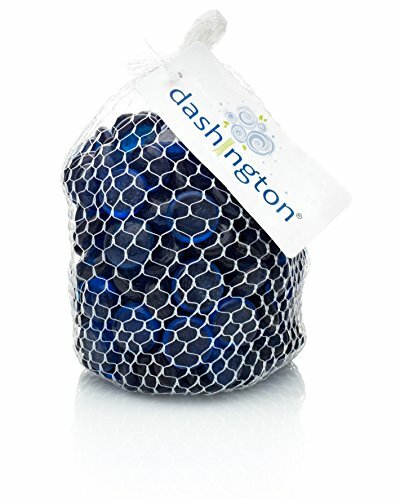 2.5 pound bag contains approximately 250-300 marbles. This entry was posted on December 3, 2018, in Sculptures. This entry was posted on December 3, 2018, in Art. HANDMADE GLASS DESIGN – This beautiful glass pendant necklace are 100% handblown and painted by professional artisans. The vivid glittering colors, unique design and finished with black enamel paint in the back of pendant. 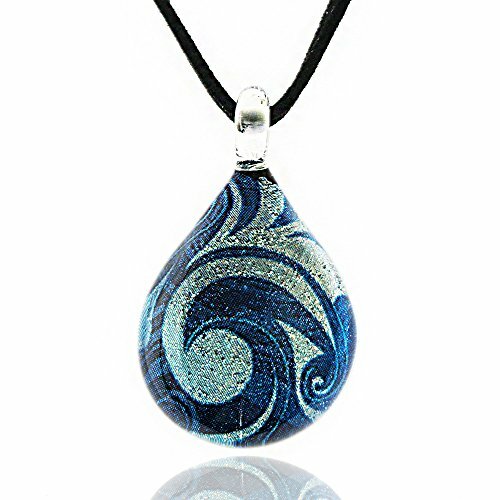 TEARDROP PENDANT NECKLACE – This murano glass pendant size 1.06 x 1.77 inches. The pendant comes with adjustable black leather cord 17- 19 inches long (2″ extension chain), lobster claw clasps, You can wear this of endearing necklace with a pair of jeans or wear them with any dresses. ABSTRACT ART DESIGN – When you wear this piece of jewelry, it is like you wear a piece of art with you. Beautiful vivid and sparkle glittery color of the jewelry is unique for this collection. 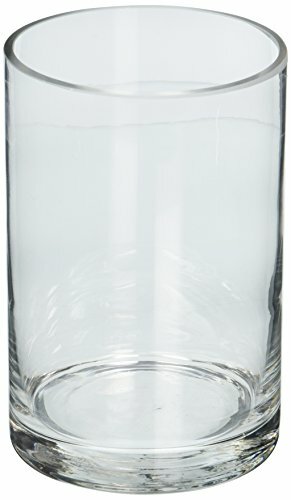 HANDMADE – Because each murano glass item is a unique work of art made by hand, slight variations of colors and patterns are possible and It is a hand blown so sometimes the little bubbles might happen, it is normal in blowing process. GREAT AS A GIFT – This beautiful of murano glass pendant necklace in a pretty Black Velvet Pouch would be a perfect gift for that special someone in your life. Buy these pendant necklace for your wife, daughter, sister, or best friend, and know that without a doubt you have purchased the perfect present for the any occasion, whether it is for mother’s day, valentines-day, Christmas, graduation or their birthday. 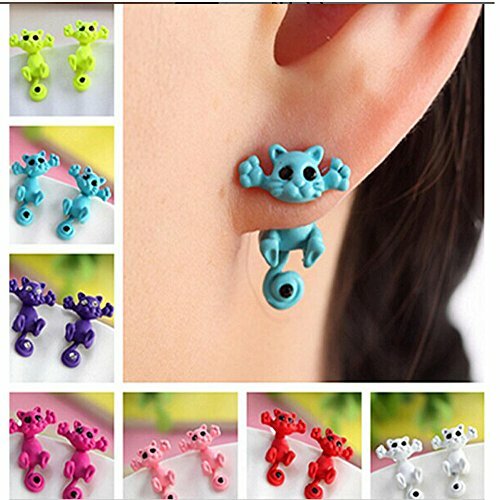  Designed to be cute cartoon cat appearance, these ear studs are lovely and fashion.  Match with suitable apparel for different occasion.  Wonderful gift for you and your female friends.  Catch this beautiful accessories for you.  WensLTD offers stylish and contemporary jewellery in accordance with current fashion.  You can wear it in any occasions, such as souvenir, party, valentine’s day, birthday, anniversary, graduation, or a particular party, it makes you more attractive, charming, fashion and catch people’s eyes.  Great gift for women, girls, men, boys, and for special occasion, like birthday, wedding or a Memorial Day.  Satisfaction 100% Guaranteed:Click”WensLTD” for more new fashion style items;If you any have problems about our items,please feel free to contact us.Provide satisfactory response within 24 hours. A wonder of color! 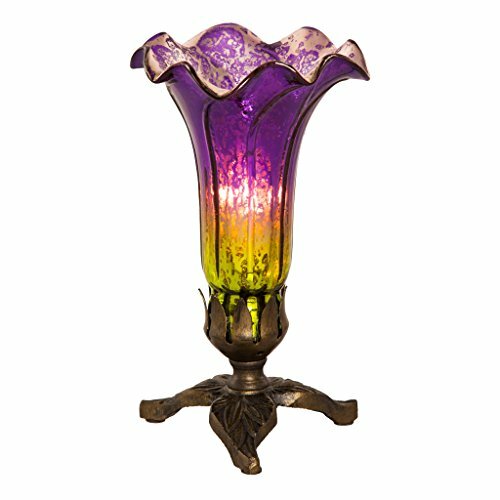 This lily lamp is handcrafted with purple and green mercury glass. The base is made with 100% hand cast metal. The exquisite craftsmanship makes this an ideal accent for any space and lily lamps also make great gift items! Requires one 15W bulb (not included). Cord length is 66 inches. 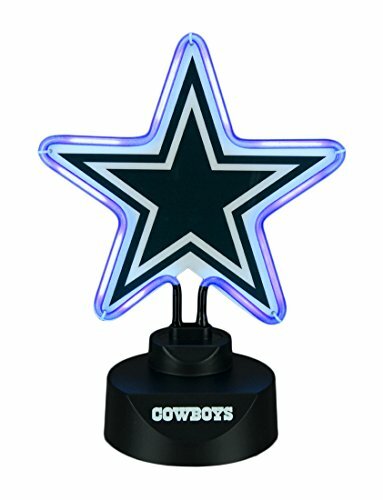 Show off your Cowboys pride with this awesome, officially licensed tabletop neon sculpture. It features a bright blue neon light tube shaped around a Dallas Cowboys star logo in navy blue and white, and has the spelled-out Cowboys logo on the base. The sculpture measures 12.5 inches high, 9.5 inches long and 5.5 inches wide. Made of glass and plastic, the light has a 73 inch long power cord, and a toggle on/off switch on the back of the base. It makes a great gift for Cowboys fans, and looks great on bookshelves, desks or tables. Go Dallas! This entry was posted on December 3, 2018, in Glass. Deep Blue Sea Centerpiece Is 9 inch High. This Is A Real Stunner! 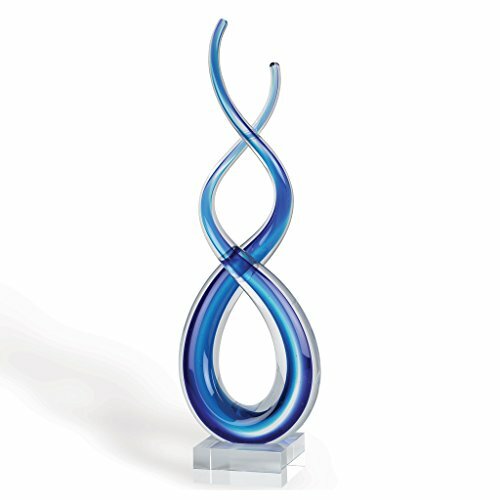 A Lovely Mouth Blown Murano Style Glass Centerpiece Mounted On A Crystal Base That Adds Warmth And Style To Any Room. This Extended Figure 8 Makes Any Figure Skater Want To Skate Those Swirls.